This past weekend, I joined more than 400,000 community members on the frontlines of climate disruption, environmentalists, workers, students, parents, and others to demand action on climate and to claim our collective rights to clean water, air, and land. As someone who has spent many years in the halls of Congress and United Nations climate conventions calling for strong climate action, this diverse, public, outspoken, and in-the-streets action was a beautiful, incredible feat that signals a tipping point in the climate movement that policymakers will not be able to ignore. But there is another tipping point that will affect the success of the climate movement: the free trade tipping point. The health of our planet depends on our ability to make big changes in our economy. These changes include moving beyond fossil fuels and building local green economies. However, our current model of free trade, which is written into agreements of the World Trade Organization (WTO) and free trade pacts like the North American Free Trade Agreement (NAFTA), threatens nearly every aspect of this much-needed economic transition. And yet, the U.S. is currently negotiating massive new free trade pacts, including the Trans-Pacific Partnership (TPP) with 11 Pacific Rim nations and the Transatlantic Trade and Investment Partnership (TTIP) with the European Union. These deals would severely restrict the ability of governments to restructure our economy and address the climate crisis. If these deals are beat-back, we can open up space for governments to embrace a new model of trade that is compatible with -- even supports -- efforts to combat the climate crisis. If these agreements move forward, they lock in a new set of rules that will further hinder our ability to solve the climate crisis. Let's take a deeper look at just how our trade rules are getting in the way of climate progress. Corporate challenges to climate and clean energy policies: In order to combat the climate crisis, we must move beyond fossil fuels and embrace clean energy. However, investment rules in free trade agreements and bilateral investment treaties threaten our ability to do so. The rules actually empower corporations to sue governments, in the secrecy of private trade tribunals, over laws and policies that corporations allege reduce their profits, including protections from dirty fossil fuels. Such rules have allowed corporations including Chevron and ExxonMobil to launch nearly 600 challenges against almost 100 governments. Increasingly, corporations are using these perverse rules in free trade and investment agreements to challenge energy and climate policies, including a moratorium on fracking in Quebec, a nuclear energy phase-out and new coal-fired power plant standards in Germany, and requirement for a pollution clean-up in Peru. Nearly 60 percent of so-called investor-state cases are decided in favor of the investor (making taxpayers foot the bill to the corporation or investor) or settle (sometimes weakening the policy, as happened in Germany). When governments "win," they just get to keep the policy in place and are often stuck with part of a legal tab averaging $8 million per case. Unfettered exports of fossil fuels: The vast majority of fossil fuel reserves must stay in the ground in order to avoid climate catastrophe. We have to move beyond fossil fuels here at home and stop exporting them to other countries. Current free trade rules once again stand in the way. The U.S., for example, is legally bound to automatically approve all exports of natural gas to countries with which it has a free trade pact. (If no free trade pact is in place, the Department of Energy must conduct a public analysis to determine whether exports are inconsistent with the public interest before granting a license.) And there is increased talk of a potential free-trade challenge to current U.S. restrictions on crude oil exports. In fact, the EU is pressuring the U.S. to lift its crude oil export restrictions in the context of its negotiations on TTIP, the U.S. EU trade pact. According to Oil Change International, lifting the crude oil export ban would lead to 9.9 billion barrels of additional crude between 2015 and 2050, which would release as much carbon dioxide as 42 coal-fired power plants. Restricting local and low-carbon economies: Another part of solving the climate puzzle relates to production and consumption: We need to start producing and using products, from our food to our energy, closer to home. Sadly, the current trend is to produce goods wherever labor is cheapest and environmental protections are lowest and ship them across the world. (This trend, incidentally, was made possible--even encouraged--by free trade rules.) But think about the endless benefits, both for our climate and for the creation of new green jobs, of producing wind turbines and solar panels locally. In fact, strong domestic renewable energy industries may be one of the most powerful tools to combat climate disruption. The transition to a clean energy economy depends on local renewable energy industries that can challenge the power of the fossil fuel industry. Governments across the world recognize the benefits of renewable energy programs that create green jobs. From Ontario, Canada to India--in addition to a number of U.S. states--governments are increasingly using "local content rules" that require enterprises to purchase or use locally-manufactured goods in renewable energy programs. But a long-standing tenant of trade law is that governments cannot "privilege" local goods or producers over foreign ones, so there have been a string of cases at the WTO challenging local content rules in renewable energy programs. Japan and the EU have used WTO challenges to strike Ontario, Canada's local content rule out of its clean energy program; the U.S. is challenging local content rules in India's national solar program; India has, in turn, threatened a number of U.S. state-based renewable energy programs; China is threatening local content rules in EU renewable energy programs, and the list goes on. Unfortunately, the trade rules described above are a small sample of the myriad rules that make it difficult to bring about what the 400,000-plus people marching the streets of New York City want -- strong action on climate. But, all of this is not reason to despair--it's a reason to organize. Bigger and badder threats from the fossil fuel industry have set a fire under the climate movement. 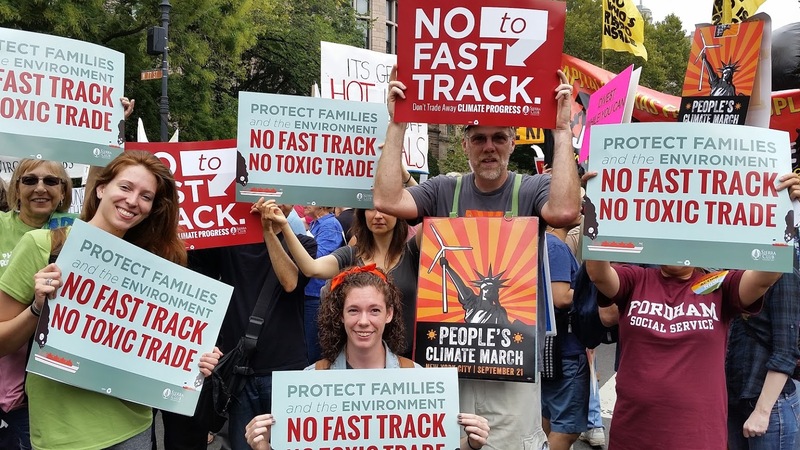 New, dangerous trade deals such as the TPP and TTIP, which threaten health, environmental, and worker protections, have set ablaze another movement of trade justice advocates. If we can combine the force of these movements and continue to strengthen our work, the power of our movements will tip our governments to act on behalf of the people instead of on behalf of the polluters. The climate movement must stand up to the free trade rules and ideology that helped get us into this climate mess and that will thwart our ability to solve it and say, "enough is enough."